It was late in the afternoon by the time we’d completed the scenic drive through Yosemite National Park. We’d been distracted by the looming face of Half Dome, panoramic views, lunch by a sparkling stream, neon green wolf lichens, and the sweet, butterscotch scent of sun-warmed ponderosa pine bark. My cousin Heather and I had already visited Yosemite on previous trips (separately), though, so we pushed eastward toward a new destination. 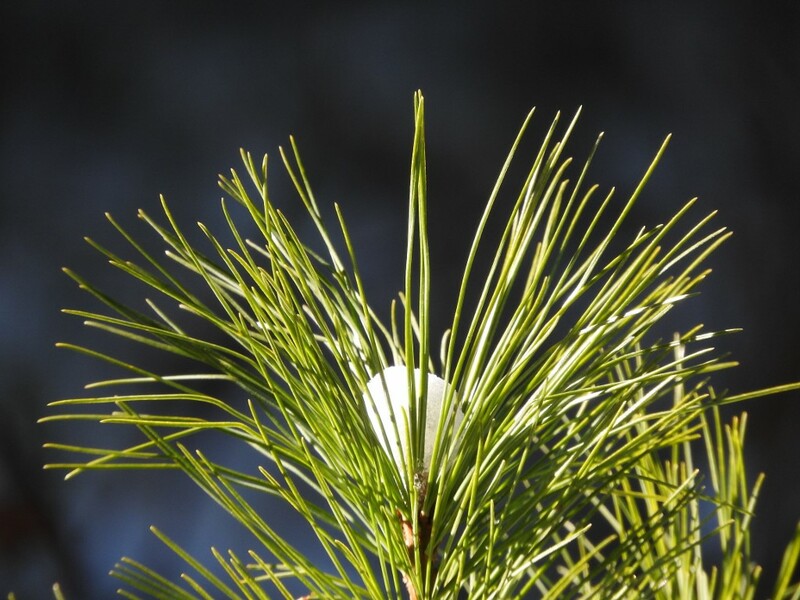 Have you ever smelled a Ponderosa Pine? YUM! Photo by Heather Edvenson. During an Introduction to Geology course back in my days at Northland College, I’d seen a photo of a landform known as Devils Postpile in our textbook. The image of huge bedrock “logs” all stacked together captured my imagination just as it had captured the imaginations of John Muir and President William Howard Taft. Taft designated it as Devils Postpile National Monument in 1911, under the recently created Antiquities Act. Nestled deep in a valley in the eastern Sierras near Mammoth Lakes, California, this unit of the National Park Service has a very short season. Even though the summer shuttle into the monument had ceased to run, and no ranger in a flat hat stood in the boarded up fee station, the narrow, winding entrance road would be open until October 31, or until snow made it impassable. No snow was in the forecast as we hiked in tank tops toward the Postpile. We had perfect timing. Late afternoon sun streamed through the trees and illuminated the unusual rock formation. The Devils Postpile is a striking example of something called columnar jointing. It occurs during the cooling process of lava, especially down within the lava flow or when the lava is intruded into other rocks. Most materials take up more space when they’re hot, so as the surface of the lava flow begins to cool, the material contracts. To relieve the strain of this change, the rock fractures. The amazing thing is that the contraction occurs at centers which are evenly spaced throughout the rock and forms hexagons. As the lava continues to cool, the joints get pulled down into the mass of rock, and we end up with these tall, tightly packed, hexagonal columns. Heather and I admired the angular wall, its striped shadows, and the wash of lovely green lichens. We also scrambled around at the edge of the scree field beneath the cliff, on a search for the most perfect hexagonal chunk of rock in the heap of rubble. The columns formed within a lake of lava caught behind the dam of a glacial moraine about 82,000 years ago, and have been brought to the surface by years of weathering from more recent glaciers and a nearby river. The erosion continues, and one by one, the columns detach from the wall and tumble down. Near a similar formation on one of the Hawaiian Islands, people have used broken hexagonal columns in place of logs to build roads and bridges. Although I was thrilled to witness firsthand the textbook images of Devils Postpile, I was even more enamored when we followed a trail up to the top of the formation. While glaciers were excavating this cliff, the sand and rocks locked in the base of the ice acted like sandpaper and polished the newly-exposed surface of the lava bed. Thousands of years later, a setting sun glinted off the smooth rock surface inscribed with a striking pattern of hexagons. Heather, a chemist, couldn’t help but ponder the chemical properties at work in the rock. And I, having just started the planning process for our next exhibit about bees, couldn’t help thinking that this looked like a giant stone honeycomb. Hexagons are an excellent shape if you’re interested in having the greatest volume, with the shortest possible perimeter, and no gaps in between. These properties make hexagonal jointing an efficient way for the lava to release stress as it cools. They also make the hexagon an efficient shape for storing honey. Instead of being a product of cooling, though, the bees’ hexagons are a product of warming. As many worker bees simultaneously use wax to form little round storage pots in the hive, the honeycomb starts off as a series of closely-packed circles. The next step for bees is to heat those wax circles until the wax flows together. The closely packed circles flatten into each other and astonishingly precise hexagons appear. Hexagons appear all over nature. 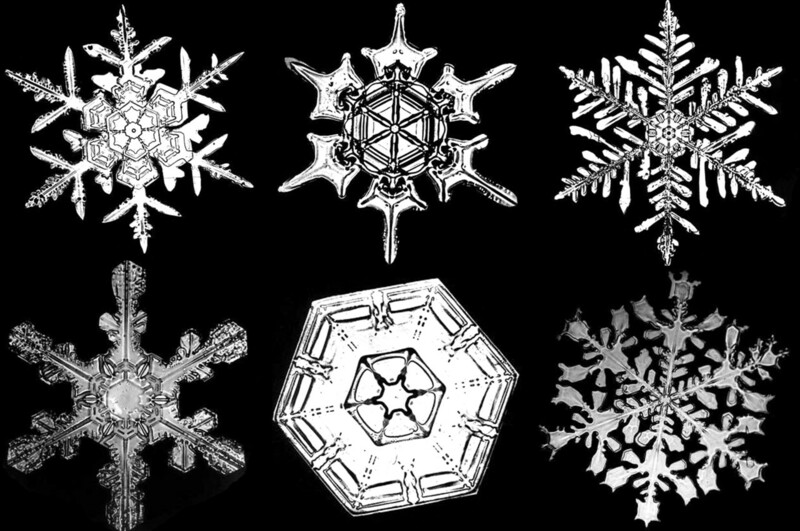 The scutes of turtles’ shells, snowflakes, and the crystal structures of some minerals all use this efficient shape. Columnar jointed rocks like the ones in the Devils Postpile aren’t uncommon, either. The striking waterfalls of Gooseberry Falls State Park in Minnesota have cut into thick layers of 1.1 billion-year-old columnar jointed basalt. Many roadcuts along Highway 61 up the North Shore of Lake Superior exhibit this fracture pattern, too. 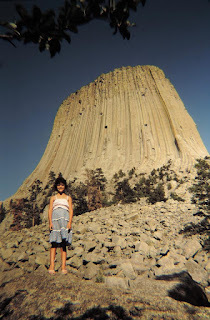 Devils Tower in Wyoming is a huge example. Columnar jointing captures the imaginations of people around the globe. 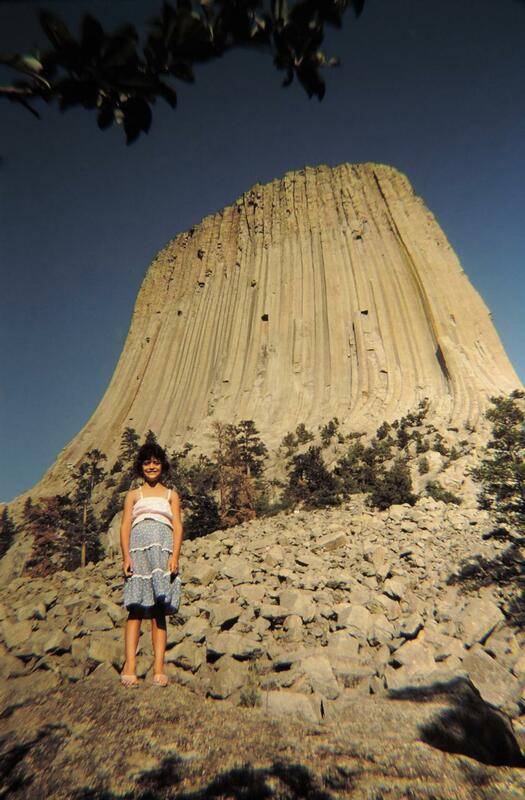 Visiting Devils Tower on a family vacation when I was 8 or 9 was probably my first time ever witnessing columnar jointing. I was I also think it was the last summer I could wear that favorite blue skirt! The Native American folklore surrounding the site captured my imagination. Photo by Larry Stone. Middle Falls, Gooseberry Falls State Park, MN. You can't see the columnar joints in this photo, but I know they're there! This is where I first understood how they formed, thanks to Craig Prudhomme, my instructor for Fall Block. I’ve circled the base of Devils Tower. I’ve written assignments about the patterns in Gooseberry Falls. I’ve driven up the North Shore countless times. 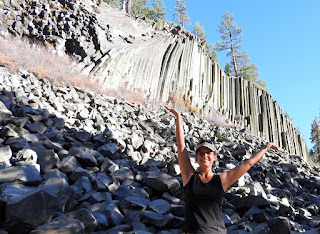 So it wasn’t the novelty of the Devils Postpile that drew me there, but the sense of connection I feel when I encounter something familiar in a far-off place. Only those mini trees aren’t really trees, at least not anymore. 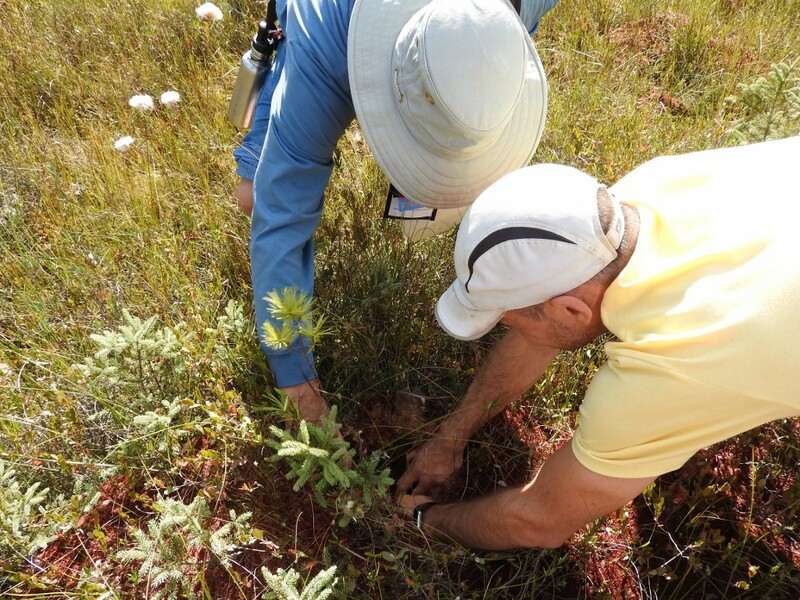 You might know them as ground pine, prince's pine, or club moss. If you’re botanical, you might even know them by their genus Lycopodium (Greek for little wolf foot). None of those names are entirely accurate, though. These definitely aren’t pines, or mosses (or wolves! ), and new DNA studies have made the scientific classification more complicated, too. With such a “quick and cheap” lifestyle, the arborescent lycopsids both grew and died rapidly. This allowed them to dominate habitats following short-term disturbances (like frequent fires), and leave behind a tremendous amount of woody debris in those tropical swamps. The bountiful organic matter in those swamps was eventually buried and turned into coal. When I first wrote about lycopsids two years ago, I read and glommed onto a fascinating theory about why the fallen tree didn’t decompose. Scientists speculated that the fungi and bacteria of the time had not yet developed the ability to decompose the tough, brown lignin found in wood. 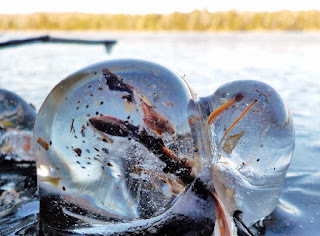 I loved this story, and told it often during nature hikes and programs. Just this fall, as I was following up on research done by Matt Nelsen (the lichenologist who showed me pin lichens at the mushroom foray), I discovered that he’d written a paper titled “Delayed fungal evolution did not cause the Paleozoic peak in coal production.” He and his colleagues had found multiple lines of evidence that not only were there microbes around during the Carboniferous that could digest lignin; they also showed that lignin wasn’t as important in lycopsid trees as we’d originally thought. Those early plants had bark made of a substance without any modern equivalent. So why did our vast beds of coal form? 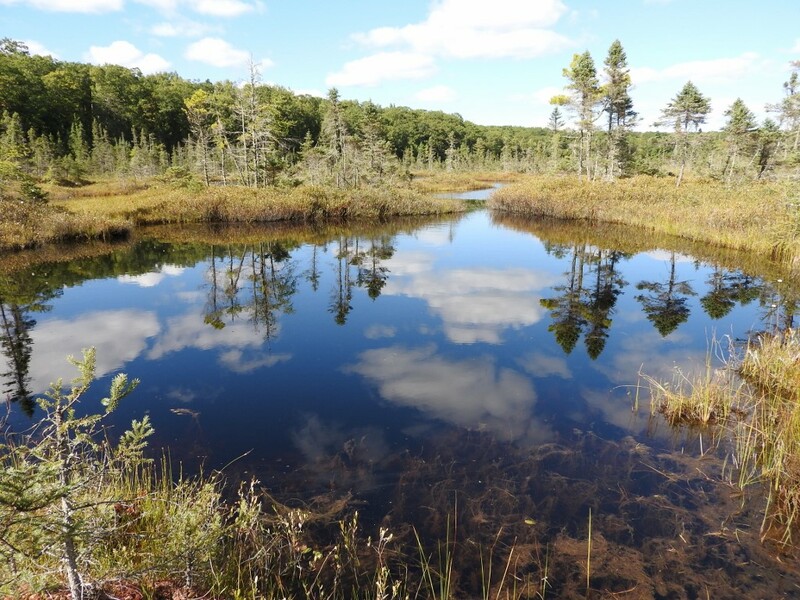 Nelsen thinks that the plants were growing and dying so quickly that the process of decay couldn’t keep up, and geologic forces related to the formation of the supercontinent Pangea caused the log-filled swamps to be buried quickly. This story isn’t quite as cool as the original, but scientists don’t get to consider things like that. When evidence contradicts what we think, we change with the times. The story we’re left with is far from boring, though. The unique conditions present during the Carboniferous Period may never be repeated on Earth. As carbon in the air became locked up in coal deposits, in the explosion of land plants, and in limestone beds under the ocean, the conditions no longer supported giant lycopsids. They shrank into diminutive quillworts, while their cousins became the clubmoss we know today. Complex plants with seeds, extensive vascular systems, and trunks that could grow out as well as up succeeded instead. Editor’s Note: Portions of this article were originally published in 2015. “November is a sigh; a sigh of weariness after the tumult of summer, a sigh of resignation over projects yet undone, a sigh of regret for hopes unfulfilled. It is a sigh of frustration that no matter how we try, the world seems to be sinking deeper into the morass, and a sigh of sadness that neither we nor those around us seem to live up to our expectations.” So wrote Lois Nestel, the Museum’s founding director and naturalist, over three decades ago. It is a gray sentiment, to match the gray clouds and gray trees of this time of year. I feel it, too. With little daylight left after work, it’s hard to want to get out for a walk. When I do, the air is damp and chilled, and the landscape dreary. Lucky for us, Lois had the fortitude to continue past her sigh and philosophize about a different perspective we could take. She wrote, “Nature also sighs, but in a gentler mood. It is the sigh of relaxation as hibernating creatures slip into their long sleep. 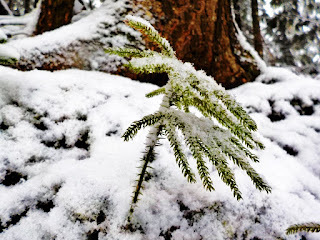 It is the gusty sigh of pines yielding to the cold north wind and the almost silent sigh of leaves and grasses settling closer to the bosom of the earth beneath the gentle pressure of the snow. “We are in limbo. It is an in-between time when looking forward appears as pointless as looking back. The short gray days and long black nights are conducive to dark thoughts…yet, why? “The badge of hope is pinned to every twig as tightly furled buds encase next summer’s glory. The cocoon, hung high in the tree, is a symbol of faith in a warmer, bright day. 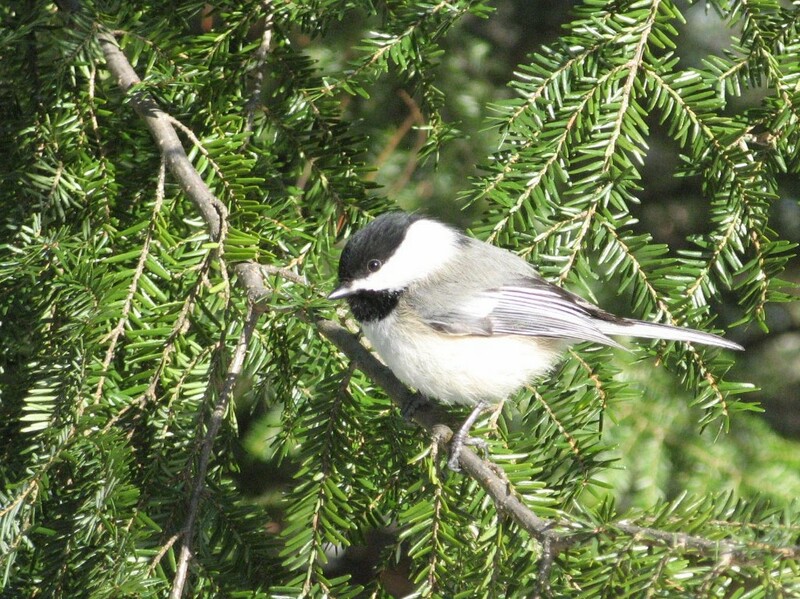 Courage and cheer are exemplified in the sprightly chickadee, who finds joy in just being alive. Patience marks the bed of seed and spore. So, why the gloom of human spirit? “Perhaps we have strayed too far from our beginnings. The wall of human thought and intellect that should have raised us to the heights of glory has instead separated us from the beauty of simplicity and faith. We demand, we demand. We have set ourselves upon a throne, despotic rulers of all we survey. Man is such a small cog in this complex world. Biologists have found an average of 1356 living creatures in the top inch of a square foot of forest soil; and did you know that the average size of all living animals, including man, is about that of a housefly? Yet we are so big in our own eyes! Lois must have been caught in this mood for several weeks, for a later essay of hers reflects these same themes of renewal and humans’ removal from it. Just as Lois saw hope in the form of a tree bud, she sees hope in the demise of a rabbit, which might, in fact, provide nourishment for a future tree bud. She wrote, “The first snow of the season blanketed the ground and reflected back the moonlight with unaccustomed brightness. Looking out, I thought the world seemed empty of life, silent and pristine. The illusion was soon shattered as from somewhere in the shadows of the trees came the piercing, quavering cry of a rabbit, rising to a shriek and then ending abruptly. “My first thought was, “Oh, the poor thing—what a pity.” I believed it to be the work of a resident great horned owl, and I pictured the silent swoop, the clutch of talons and the great, tearing beak. Then, lying back, I mulled over the subject. “The death was but a link in the chain and sad only for the rabbit. For the owl, as prime predator, it was cause for fierce pleasure and satisfaction, a sustaining of life. Lesser creatures would glean crumbs from his table, bits of flesh and bone to be gnawed by mice and shrews, to be picked by birds; nests would be lined in spring with scattered hair. Remnants of body wastes and liquids would sink into the earth to nourish next year’s blade or twig which in turn would nourish, perhaps, another rabbit in the passage of time. “Left to its normal management there is no waste in nature. Part of the owl flying in the night sky and the beetle beneath dead leaves is the rabbit who ate the twig whose nutrients came from death and decay. Everything uses and is used, is changed and converted but never lost. “I regret that human standards have removed us from the natural chain. Human civilization has come to mean constant taking, seldom returning. How long will nature tolerate us? Lois’s perspective brings comfort in this gray season, and I resolve to take my next walk with eyes open to the life curled up inside buds, the cocoons protecting delicate moths-to-be, the chickadees' indomitable cheer, and the renewal inherent in every bit of death. Hopefully you, too, will find ways to ensure that your November sighs indicate contentment and peace. 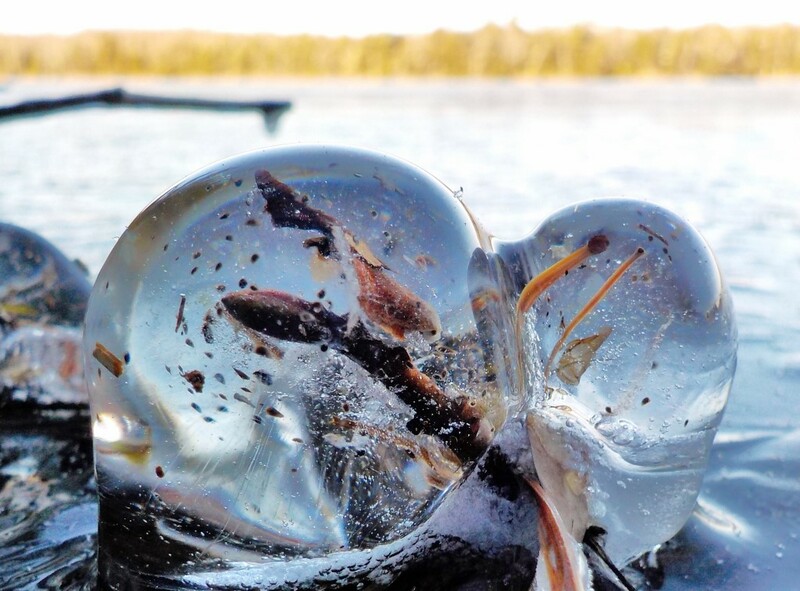 The bud of an alder shrub lies encased in ice near the shore of Lake Namakagon. None of us had rubber boots handy, so when we came to the log bridge across the moat we took off our shoes and went barefoot. I enjoyed the firm roughness of the decorticated log on my soles, and then the cool squish of the sphagnum moss in the floating mat as I stepped into the magical world of the fen. I love bringing appreciative people into the Namekagon Fen, and my companions on this day were wonderful. Peter Kennedy is an associate professor at the University of Minnesota, and had just given a talk called “Knee deep in peatland fungi: Mycorrhizal community diversity and composition in fens and bogs of the Northwoods.” He’d already been to one nearby bog as part of the North American Mycological Association’s annual foray, held this year at Lakewoods Resort near Cable, but when I offered to show him a giant fen as well, his eyes lit up. As I gave some final instructions to my volunteers at the information desk, and prepared to play hooky from the foray for a couple hours, Michael Beug walked up with his camera. Michael is a professor at Evergreen State College in Olympia, Washington. 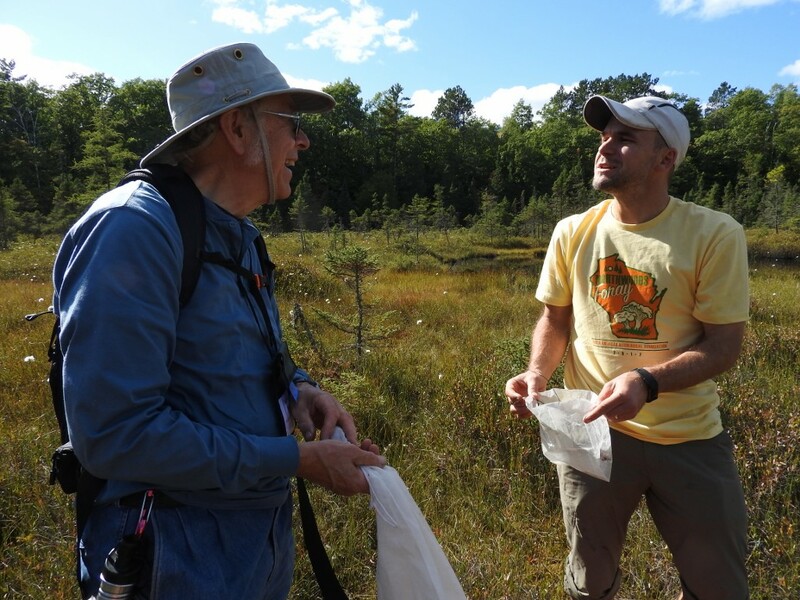 Back in the day, he teamed with the college’s ornithologist to study the impact of DDT on calcium transport in birds, and this work played a major role in getting the pesticide banned. He and Peter met during Peter’s undergraduate studies. They started chatting, and soon Michael went off to grab his camera so he could join us. So there I was, ankle deep in cold, wet sphagnum with two PhDs who were talking a mile a minute about shared experiences and recent news, with occasional breaks to point out neat things in the fen. Waving his hand over a patch of dead sphagnum moss, which looked bleached and scraggly compared to the velvety-red living moss beside it, Michael informed me that it was killed by a fungus. 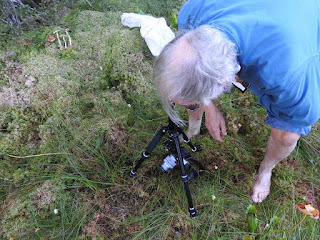 He poked around for a bit, hoping to find the delicate, pink mini-mushroom forms of Roseodiscus sp. No luck. I offered up the impressive fact that my previous explorations had revealed this fen to be over 40 feet deep, with the bottom still out of reach of our current tools. We also found pitcher plant leaves, a tiny frog, a few late-blooming bog laurel flowers, a couple of red-orange waxy cap mushrooms, and a tiny white pine seedling growing out of a sphagnum hummock. 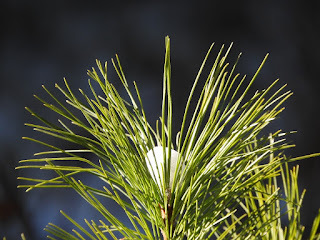 Without hesitation, Peter dove elbow-deep in the moss, following the white pine’s stem down to its roots, and out to the fine roots to look for mycelia. Tree roots aren’t actually that great at directly acquiring the water and nutrients they need. Most, but not all, plants have instead cultivated a symbiotic relationship with fungi in the soil. 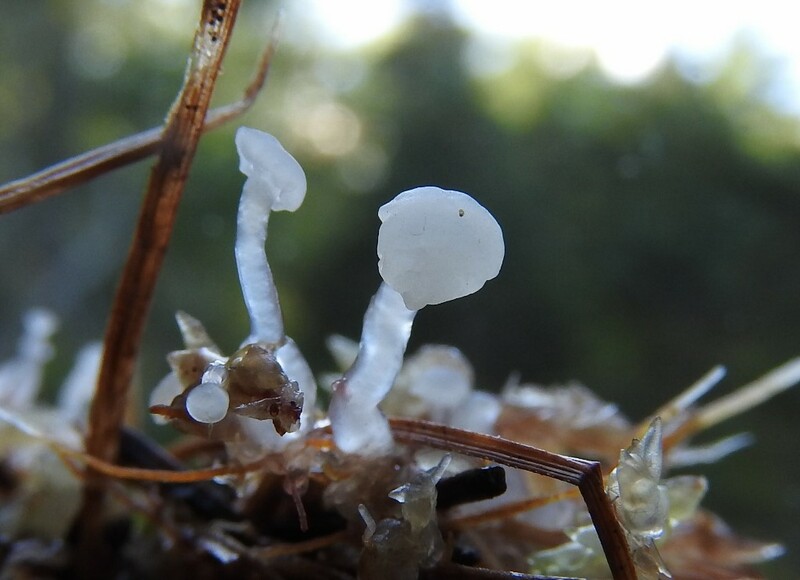 A web of thread-like fungal mycelia connects with the tree’s roots to bring it water, minerals, nitrogen, phosphorus, and even protection from pathogens. In return, the tree feeds the fungi sugars it produces through photosynthesis. As Peter described in his talk, this mycorrhizal (fungus-root) relationship is important in bogs and fens because they are especially challenging, low-nutrient environments. We replanted the tree (although lack of mycelia suggested it didn’t have much of a chance), and wandered some more. We were almost back at the bridge when things got even better. I pointed out a little black spruce grove where orchids bloomed in July. We wandered in. Michael plunged his hand into the sphagnum, and brought up a handful of wiry black spruce roots—their finest tips neatly capped by a white sheath of fungal mycelia. These trees were thriving with the help of mycorrhizal fungi. Then the guys spotted some big brown mushrooms. “Hebelomas,” Michael called them. “They’re boring mushrooms nobody looks at,” Michael told me, but his friend Henry Beker from the University of London just finished the monograph on the European Hebelomas, so Michael wanted to help him document the ones here, too. They may be mycorrhizal, which makes them interesting to me. As Michael was stooped over his tripod getting the drab, brown mushrooms in focus, Peter happened to see something else between his feet. I couldn’t even begin to understand what they were exclaiming over until Peter brought up a small clump of sphagnum moss for me to see closer. Clusters of miniature mushrooms bejeweled the mess, and their white bodies glowed in the sunlight like frosted glass ornaments. Neocudoniella radicella: this little mushroom is found in sphagnum bogs where black spruce rootlets turn up out of the soggy mat to get air. 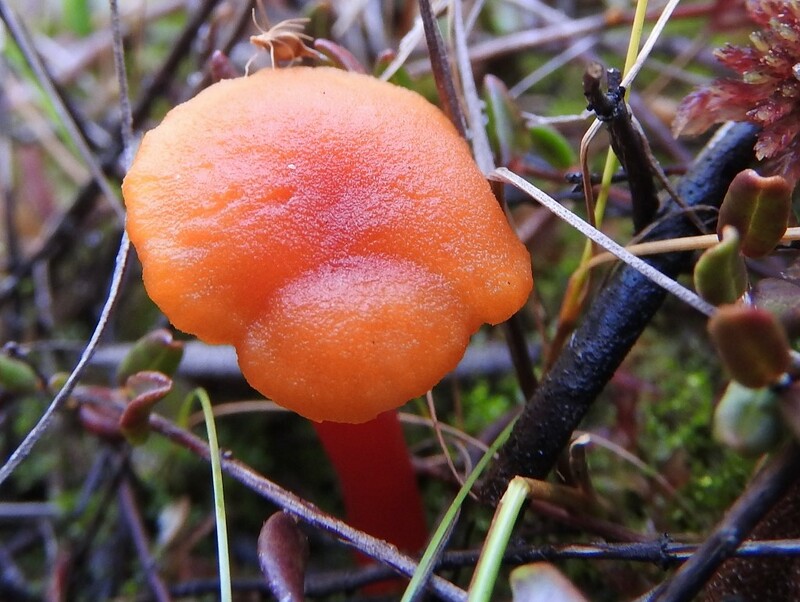 It was a “lifer” for Michael, a mushroom he’d never seen before. “The fact that I knew it existed in a place that is incredibly beautiful and magical made it an object of desire,” he later told me. A little handful of the gems went into Peter’s collecting basket, and eventually made its way through the vouchering process in the basement of Lakewoods. One last hurrah came that evening during announcements. Our tiny gems had been chosen by the mycologists as the “find of the day”! That was nice, of course, but there was nowhere to write on the voucher form that the fen where these mushrooms grew was filled with bare toes squishing the sphagnum, joy bubbling up in the sunshine, old friends reconnecting their bonds, and new friends sharing an adventure. The fen is filled with treasure!